Former Arsenal defender Bacary Sagna has said that Paul Pogba is doing his job right ahead of the FIFA World Cup in Russia. Former Arsenal and Manchester City midfielder Samir Nasri is apparently closing in on a move to Zenit St Petersburg on a Bosman. The Frenchman has been a free agent since his release from Turkish outfit Antalyaspor last month. Serie A strugglers Benevento are looking at the prospect of recruiting both Samir Nasri and Alex Song this month. The Italian minnows pursued the signature of former Arsenal favourite Bacary Sagna on a free last week. Former Arsenal and Manchester City defender Bacary Sagna is reportedly considering a move to German club Wolfsburg. 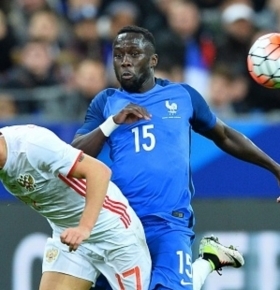 The France international has been a free-agent since his release from the Citizens in late May. Former Manchester City and Arsenal defender Bacary Sagna is reportedly set to snub advances from Leicester City for a switch to the Serie A.
Leicester City are reportedly weighing up a contract offer for former Arsenal and Manchester City defender Bacary Sagna. The France international has been a free-agent since his release from the Citizens at the end of last season. Former Manchester City and Arsenal defender Bacary Sagna could be handed a Premier League lifeline with both Leicester City and West Bromwich Albion interested in his services. The 34-year-old is a free agent following his release from the Citizens in June. Leicester City will not be pursuing a move for former Manchester City and Arsenal defender Bacary Sagna. The France international is on the search for a new club after he was released by Manchester City at the end of the previous campaign. Fernando becomes the latest player to leave Manchester City as the Brazilian joins Turkish giants Galatasaray for a fee of €5.25 million. Manchester City are set to lose another full-back after manager Pep Guardiola confirmed that Serbian defender Aleksandar Kolarov will join Roma next season. Manchester City will lodge a fresh attempt to sign Monaco left-back Benjamin Mendy after their £44.5m bid was turned down earlier in the week. An underwhelming start to his career as manager of Manchester City saw Pep Guardiola's reign fail to produce a Premier League title challenge and an early elimination from the Champions League. Following this summer’s spending, Guardiola will be looking to his new players to perform. There will be little room for disappointment this season. Manchester City have secured the signing of defender Kyle Walker from Tottenham Hotspur after they agreed on a club-record £53m deal for his services. The 27-year-old has signed a five-year deal with the Mancunian giants where he will wear the number two shirt. Following his release from Manchester City at the end of last season, Bacary Sagna is wanted by numerous clubs across Europe, including West Bromwich Albion and Crystal Palace of the Premier League. The Ivory Coast international, who already expressed his desire to leave PSG before, has inched closer to the exit door after Dani Alves reportedly joined the Paris club. Manchester City remain confident of sealing a Bosman move for Dani Alves despite a late approach from Paris Saint-Germain to hijack the deal altogether. Paris Saint-Germain win race for Dani Alves? French giants Paris Saint-Germain have reportedly hijacked Manchester City's attempt to sign Dani Alves during this summer's transfer window. Man City to sell Aleksandar Kolarov? Serbia international Aleksandar Kolarov is apparently close to sealing a move to Besiktas during this summer's transfer window. Manchester City are prepared to cut their ties with defender Eliaquim Mangala, who is on the verge of joining Lyon. Manchester City's summer recruitment drive continues as they close in on the signing of Brazilian full back Dani Alves from Juventus.